Storytelling can be casual. It can be challenging. It can be insightful. Stories can be funny, sad, inspirational, depressing or so many other things. When you find a performer who can seamlessly blend aspects of all the above into a single, insightful show… there is reason to celebrate. Dan Ruth is such a performer. This is a man who’s been around the streets and alleys of New York nightlife and he has absorbed the details and idiosyncrasies of the people he has mingled with there. 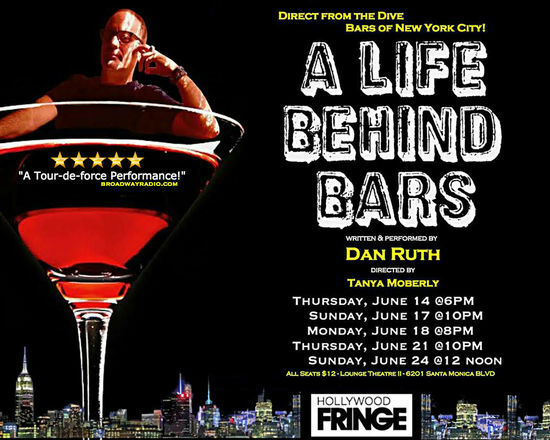 Weaving stories together that span a long series of jobs and multiple years working (and drinking) in all types of bars in a city that has all types of bars, Ruth reveals a fascinating life that holds surprising moments of highs and lows. By examining how he has been treated and how he has treated others over the course of serving so many so much, Ruth paints a self-portrait that is honest, self-effacing and bittersweet. The show does not come off sounding like a message piece, but there is depth here. It can be found in how we recognize in ourselves the acceptance or judgement of the people we meet… and of Dan Ruth himself. So many of us are just working hard, getting through our days and making ends meet. There is honor in that. The trick is sometimes to maintain it all without cracking up, isn’t it? Ruth has seen people at their best and worst and he obviously knows we all crack up a little at some point. And… he’s there to sympathize or expose the truth as he sees appropriate. It’s a wonderful thing to watch happen.